My peoples. Ain't it great to be around others who look exactly like you? Crooked teeth, check. Eastern European hook nose, check. Prominent chins, check, check, and check. Ah, the Czechs! As you can tell, I'm actually mostly Czech. Not Slovakian! 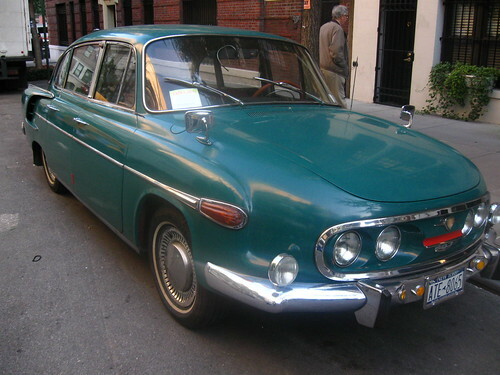 Czech. 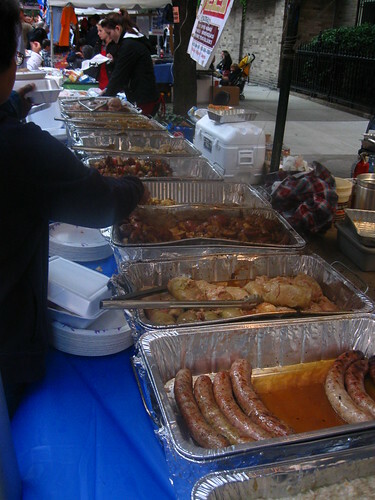 Last weekend, my peoples decided to celebrate their independence from the Austro-Hungarian Empire by eating and dancing the polka on 83rd Street. Feeling the need to reconnect, Big Bobo and I moseyed our way to the UES, to eat some klobásas and zelí. Our first stop was the Zlata Praha booth; some family members have panned Zlata Praha, but Bobo and I were willing to test it out for ourselves. He went with the roast pork, boiled cabbage, and bread dumplings (vepřová pečeně, zelí a knedlík), while I went with the sausage (klobása) and bread dumplings. Bobo said that this was the best zelí he had in a long time, and it transported him back to childhood; I refused to eat vegetables on principle as a child, but I can say this was pretty good, not sour or tart like sauerkraut, but sweet and vinegary. The cabbage wasn't over-boiled at all. 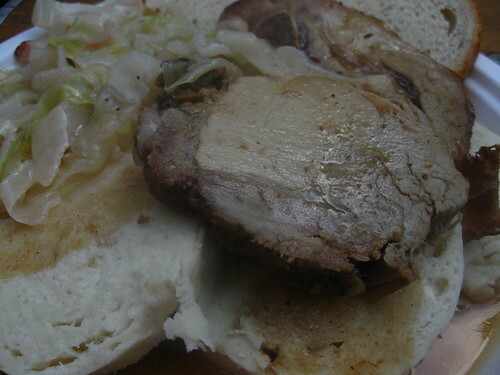 The roast pork was tender and lean, and all the juice and gravy dripped onto the dumplings underneath. My sausage was some of the best klobása we both had in a LONG time. Our old meat market in Astoria began letting us down about five years ago, and it's been a family-wide mission ever since to find a good replacement butcher. I think we may have a winner. The bread dumplings were nothing outstanding, very doughy and filling, just like how we remembered. After, we walked around a bit, listened to the latest in Czech beat-boxing skills, I attempted the polka, and then we hit up the buffet. 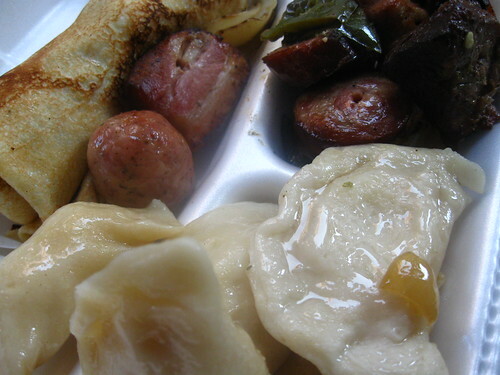 For my second round, I went shish kebab, pirogis (pirohy) and an apple crepe (palačinky); Bobo went more klobása, pirohy, and bramboráky. The other klobása was much better than this one, and the apple filling for the palačinky would have been better homemade and chunkier. 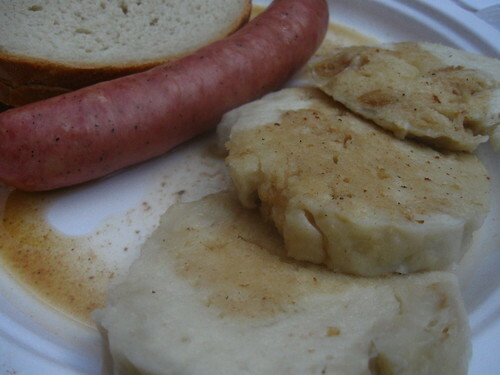 The potato pirohy was sauteed in butter and onion; perfect sized dough and packed just to the brim with moist potato filling, and the bramboráky was fried delicious potato goodness that didn't fall apart upon eating. The shish kebab was nothing special, but they did place nice chunks of pork with fat on it which I liked a lot. By this point, we were stuffed even without any Slivovitz (aka rubbing alcohol; seriously we have some at my house, one sniff could put me off booze for all of ten minutes), we decided to pick up some dessert for consumption at home, for us and the woman of Czech descent who bore us: plum cake (švestkový koláč) and apple strudel (jablečný závin). 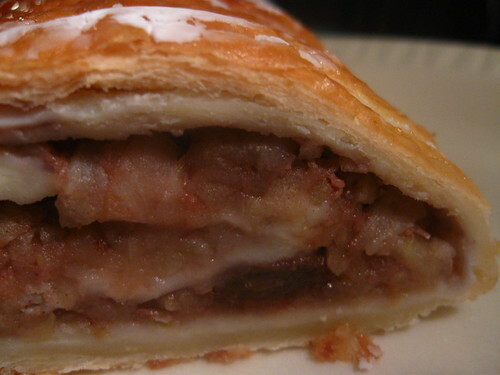 I'm used to strudel with chunks of apple, but this had apple strips instead. The dough was flaky, but not the flakiest I've ever had; I did enjoy some with ice cream on top. The cake though was the clear winner. 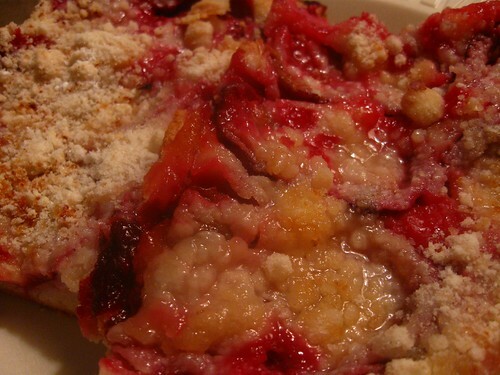 Mommsie absolutely loved it, very sweet, with a dense, tart-like bottom and a LOT of crumble on top (what looks like cheese is actually sugar crumbs). You know when you haven't had a favorite food in a long time, and it slips out of food memory? Then one day, you happen across it, have a bite, and your love come rushing back. I have a feeling this happened, and plum cake will be on the 'to do' list very shortly. 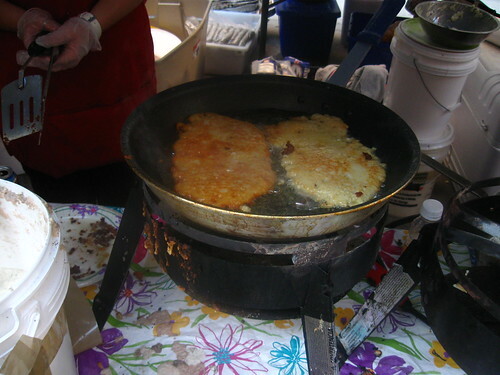 The Czech Independence Festival was run by the Czech Center New York. Hahaha I think I'd be scared to be around people who look exactly like me. Anyway the food sounds awesome... I don't think I've had much Czech food before. Know of any good Czech restaurants?